In years past, we have gotten our kids a few gifts each. We didn't really go overboard, but they also get gifts from other family members as well, which makes it seem like they get a lot more from us than they actually do. Last year we went to H&R Block and got an emerald advance on our tax return because we wanted a bigger Christmas. There's nothing wrong with that and to be quite honest, that option is available to anyone who already uses H&R Block so it's not like we have any advantage over anyone else. My husband makes good money and he works hard for it, but sometimes we still struggle. We know what it's like to not be able to afford Christmas gifts. A few years ago we were lucky to get our daughter three or four gifts at the time. So yes, our kids have not only had great Christmas mornings, but they have had crappy ones as well. Not once did they complain. Not once did they cry. They were happy and excited that Santa came. They don't brag about the items they get, and they don't ask questions when other kids get things that they don't. This is because we have taught our kids that holidays are about family and being thankful for what you do have, like a roof over your head and food on your table. Here's the thing, this year, I'm guilty of posting photos of the massive amount of Christmas gifts we have this year, but you know what? I'm not trying to rub it in, I'm not trying to gain attention, and I promise that I'm not bragging. I'm just proud. I'm proud of the fact that both my husband and I have worked hard enough to be able to splurge this year. Wouldn't you be? After years of not being able to give much, would you not be proud of finally being able to give a great Christmas to your loved ones? Another thing that I want to touch on is that no one knows who these gifts are for. The woman who's photo above is causing a stir has stated that those gifts are for other family members, too, not just her children. In my case, this is also true. Not all of the gifts we have are for my kids. I have gifts for literally every single person in my family; aunts, uncles, parents, grandparents, siblings, and even friends. And you know what? I even have a HUGE box of things to donate to Toys for Tots. 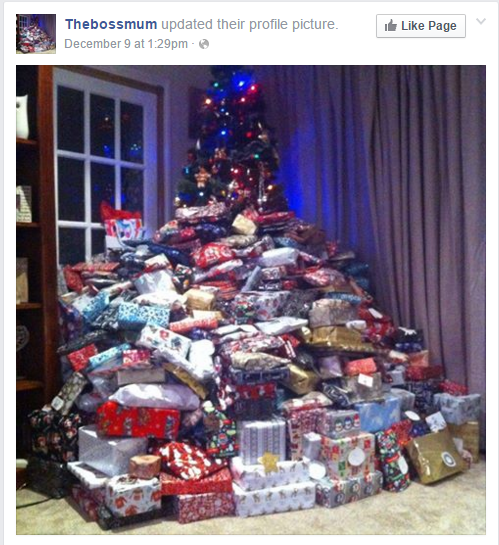 You also don't know what those items under that tree (or anyone else's for that matter) are. Just because your mind automatically assumes they are toys for "spoiled" children, doesn't mean they are. I know for me personally, we buy our kids toys, of course, but we also buy them books, clothes, jackets, shoes, bedding, and personal care items as well. Does buying my children things they actually need make them spoiled? This is one reason why it's never a good idea to assume. I'm not replacing my love and time with gifts. We take our children to museums, amusements parks, the city park, and all kinds of other fun places. We have family night where we watch movies together and play games, which by the way, is also something we do for Christmas. At least two of the gifts under our tree every single year are games or movies addressed to the entire family from Santa. A gift that we can all use to spend time together having fun. I am lucky enough to get many items from companies from this very blog. So unknown to most who judge, I rarely spend as much as it seems on gifts. About 80% or more of the gifts this year are items I was sent to review. I'm lucky to have that privilege. But you know what? I'm not selfish about it either. I have physically contacted companies for items that I could donate to those in need in exchange for a review. My children are not "spoiled". They appreciate everything they get and everything they already have. I have seen children who's parents cannot afford much act worse than children who's parents get them everything they want. You know why this is? It's not because of the amount of gifts or even the price tag on those gifts, it's how the child is raised. If you raise a child to understand that Christmas is not about the gifts from the store, but the gift of family, love, and health, they will grow up realizing that they are a lot richer than they seem. Teach your children that it's impolite to brag about what they got for Christmas. Bottom line is that it seems petty to nit pick about what you *think* others do with their time or their money. As long as my bills are paid, food is on my table, and a roof over my head, it doesn't matter if I spend $20 or $2000, I have every right to do so and so does anyone else. When you start spending most of your time worrying about what others do with their life, you waste time you could be using to make yours just as spectacular as you *think* someone else's is. Just because you can see the cover of the book, doesn't mean you know the entire story written in it's pages. I completely agree with you. There have been many years when I posted photos with tons of gifts under our tree. That was because we have a huge family party with 13+ members each year and everyone brings their gifts before. It doesn't mean people are spoiled. Also, so what if kids are spoiled? It's nobody's business but the parents! 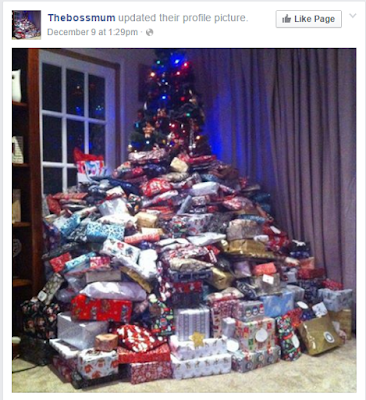 It seems like every wonderful thing, even Christmas, gets spoiled by assholes on social media.